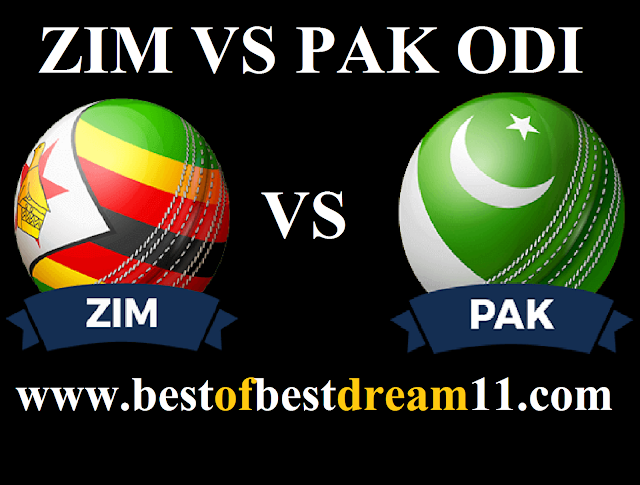 Welcome to our "BEST OF BEST DREAM 11 " for "ZIMBABWE VS PAKISTAN " 4th ODI match. Here is best "ZIM VS PAK" ,4th ODI MATCH DREAM 11 PREDICTIONS | ZIM VS PAK DREAM11 TEAM for the Fantasy user ,who venue are looking to make a strong team for maximum win. We are providing latest news, match update, information about the match .The team is picked by using various factors on the basis of performance, ground stats and latest form. "Pakistan are ahead in the five-match series 3-0.In the last three encounters Pakistan won with ease.Zimbabwe's team has disappointed everyone. 1-For Pakistan,F Zaman is their top scorer with 220 run in this series while Imam Ul Haq had score 172 runs. 2- in bowling, U Khan(7wkt) and F Ashraf(7wkt) will be crucial. 3- for ZIM, H Masakadza is their top scorer with 76 run while R Murray had scored 56. 4-in bowling , Muzarbani is leading wicket taking bowler. 1- ZIM made three changes in Playing 11 last match. They can also make some changes in this match as they had Lost Odi Series to Pakistan. 2- Pak team will make changes in the playing 11 for this match also as they had won the series. While M. Nawaz can replace S. Khan in the playing 11. NOTE - Stay connected for any latest updates .